The pumpkin sauce is lightly sweetened with maple syrup. 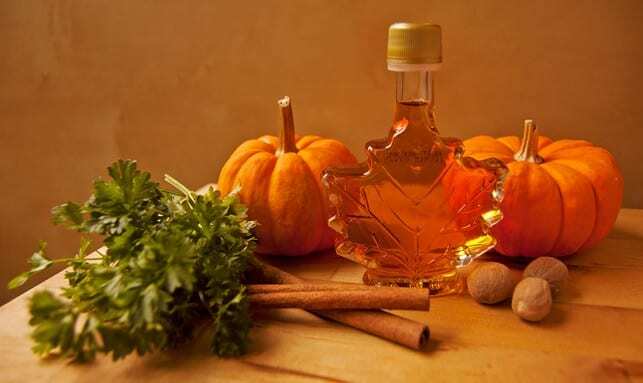 I highly highly highly recommend using real maple syrup. Hands down. It’s delicious! This adorable little maple leaf shaped maple syrup container was a wedding favor at my good friends Steve and Rachel’s wedding. They are totally fitting for their fantastic fall wedding in New Hampshire. Definitely mad bonus points on the delicious, seasonal favors…I love you guys and I loooove these cute little maple syrup bottles! 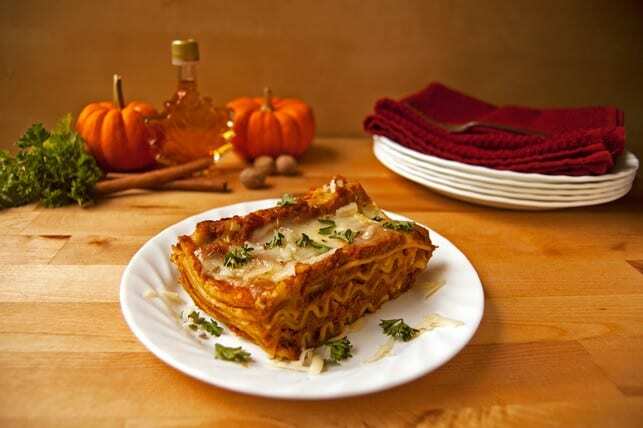 This lasagna is delicious with fresh pumpkin puree. Sugar pumpkins (the small ones that are good for eating) are in season right now (available at your local pumpkin patch like Easy Pickin’s Orchard)! What are your favorite comfort foods? I love to try them as the evenings (and soon even the days!) get colder! 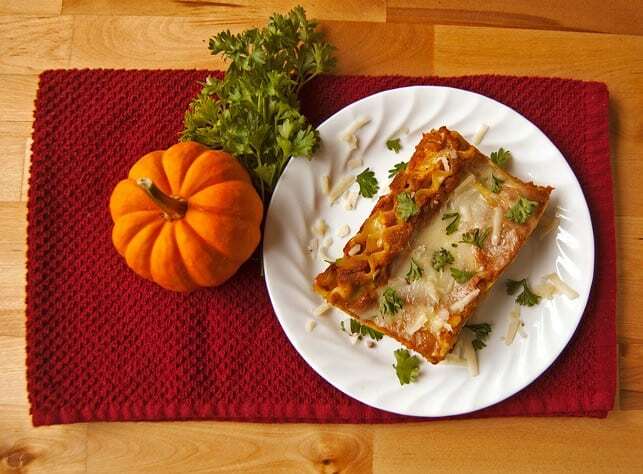 Super cheese, super creamy, slightly sweet pumpkin lasagna! A delicious comfort food perfect for cool fall evenings – tastes like a big hug! Melt butter in sauce pan on low heat. Add garlic and stir until cooked but not browned, about 1 minute. Stir in pumpkin, sugar, maple syrup, spices, pepper, and salt and let simmer until completely heated. Shred 10 ounces of mozzarella and stir together with ricotta. Slice remaining 6 ounces of mozzarella and reserve to arrange on top of lasagna. Smear a thin layer of pumpkin sauce on bottom of 9"x13" baking dish. Lay three sheets of lasagna down in the backing dish, spread 1/5 of ricotta/mozzarella mixture over the lasagna sheets, cover with 1/5 of the pumpkin sauce. Repeat this process four more times to create a total of 5 layers of noodles, cheese, and sauce. Arrange remaining 6 ounces mozzarella cheese on top of final pumpkin sauce layer. Wrap in foil. At this point the lasagna can be baked or stored in the refrigerator overnight. When ready to bake lasagna, preheat oven to 375 degrees. Cook lasagna covered for 45 minutes. Remove foil and cook for an additional 10-15 minutes, until cheese begins to slightly brown. Let rest for at least 5 minutes before serving. Enjoy! ***This will result in al dente lasagna. 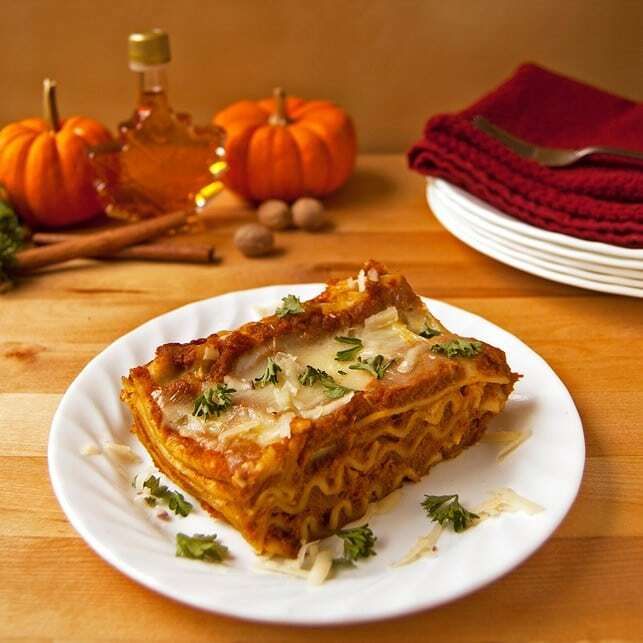 If you prefer a traditional texture, boil noodles first or use no bake lasagna noodles. No time no see, Karen! I used this recipe as a guide to make cheesy pumpkin pasta yesterday. Had to adjust based on what I had – Greek yogurt for ricotta, angel hair for lasagna, and I didn’t bake it (just stirred the sauce with the pasta). But it was terrific! I love the creamy pumpkin sauce, made all the more delicious with buttery garlic. Hope you’ve been well! Happy fall!